One thing that is hard to give up is soda — but for your health, and the health of your wallet, you really should try. Each time you go out to eat, a soda will add about $3 on your bill per person. In 2012, U.S. households spent $850 a year on soft drinks alone. As far as health disadvantages, drinking soda regularly can increase belly fat, decrease bone strength, and can increase cavities and gum disease. Soda has been linked to diabetes, obesity, cancer, and high blood pressure. Not only are these health issues scary, but they are also very costly to manage. Don't think that switching to diet will help you out either, since diet soda can be even worse for you with its artificial sweeteners. Kicking your soda habit is the best thing to do for your health and wallet, but that is definitely easier said than done. Here are some frugal ways to satisfy your soda craving without risking your health. If you have never had kombucha, then prepare yourself for a very strong drink. I could not take more than three sips of my first kombucha, but now I actually enjoy certain flavors, like Kevita's Mojita Lime Mint Coconut. Not only can kombucha satisfy your soda craving, but it can also aid in digestion because it is full of healthy bacteria. Kombucha is not the cheapest alternative to soda, unless you make your own. Buy a few when there is a coupon or when there is an iBotta offer. 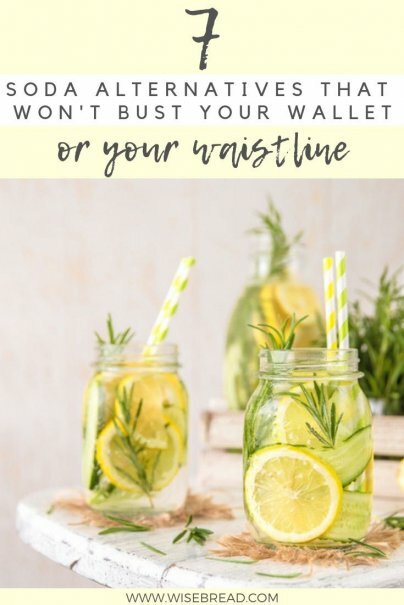 You can make your own healthier soda by mixing sparkling water, a squeeze of lemon and lime juice, and stevia (or your favorite sweetener) to taste. In my opinion, it tastes very similar to Sprite, but much more refreshing. Obviously if you are drinking soda all day, every day, you will need to allow your taste buds time to adjust. Root beer: Mix sparkling water with a few drops of root beer extract (use organic if you want to avoid chemicals), and sweetener to taste. Mountain Dew: Mix two cups of sparkling water with one teaspoon of apple cider vinegar, ½ teaspoon of grated ginger, and sweetener to taste. If you enjoy this drink, try increasing the amount of apple cider vinegar over time to increase your health benefits. Apple cider vinegar can help prevent diabetes, lower cholesterol, and give you an extra energy boost. Cherry-vanilla: Heat two cups of cherry juice with one vanilla bean (split the bean and scrape out the seeds and pod) and one cup of sweetener of your choice (use less for stevia extract). Strawberry: Blend one cup of strawberries with ¼ cup of honey (or sweetener of your choice). Put two tablespoons of this mixture into a cup and pour sparkling water on top. Use frozen strawberries for a colder drink. Another easy alternative to soda is mixing one part juice to two parts seltzer water. Use juices that are 100% juice. Pure pomegranate and cherry juice will give your soda an extra health boost. It is not always convenient to make your own soda, especially if you are traveling. Flavored sparkling water will give you the carbonation and sweetness you are craving. My favorite is the coconut flavored La Croix because when it is really cold, it reminds me of a Coke. Check the labels on sparkling water and make sure that the ingredients are only water and flavoring. Avoid any that have sugar or artificial sweeteners in them. If you need a soda alternative that has caffeine, then the Bai waters are tasty and have as much caffeine as tea. Costco regularly has coupons for Bai water. If you drink soda strictly for caffeine reasons, try going with unsweetened green tea. It will be a big switch on your taste buds at first, but the caffeine from green tea is a little gentler on the system compared to soda and coffee. Green tea is also full of antioxidants and can reduce your cancer risk. The easiest way to get green tea on the go is to pop a tea bag into a water bottle and let it sit for about 20–30 minutes. Perhaps you are continually reaching for soda to quench your thirst. Many people will avoid water because they find the taste boring. Try adding fresh cut up fruit or vegetables to make your water have more flavor. Some options to try are cucumbers, strawberries, lemon, lime, oranges, grapefruit, and mint. Mint water can help promote your digestion and reduce inflammation. When you are trying to kick your soda habit, you don't want to just replace it with another bad habit. For example, if you use five cups of soda to get you through the day, then switching to five cups of coffee is not going to do anything for your budget or health. The best thing to do is to try to change your taste buds and decrease your cravings. For example, if you drink three cups of soda a day, try replacing one cup with just plain water, and the other two cups with one of the healthier alternatives. If you are used to having a big cup of soda always at your hand, then put ice water in the same type of cup. You will reach for the water out of habit, and it will take a few days to accept the water as a suitable substitute. Prepare yourself for a few days of withdrawal headaches, knowing that these get worse before they get better. What are your favorite alternatives to soda? Soft drinks do not uniquely cause the litany of health issues outlined here. Many risk factors contribute to obesity, diabetes, cancer, and high blood pressure, and therefore, it’s overly simplistic and misleading to suggest any one product is the culprit driving these complex conditions. Bottom line: our industry’s products have been intensively studied and deemed safe by world-renowned scientists and approved by regulatory agencies around the globe. Thank you so much for your thoughts. I definitely agree with you that not one product is to blame. One soda every once in a while is not going to kill you or give you diabetes right away. However, many people have addictions to soda just as some have addictions to coffee. The overuse of either and the over consumption of sugar and food dyes has been identified to cause problems. Many avid soda drinkers know that their daily drinking habits are not the best for them, but it is hard to cut back. This article is a motivation to help soda drinkers (and even those who drink too much coffee) to cut back and replace their soda love with something healthier and easier on the budget.